The rear camera is a cheap throw-in and there's not battery or capacitor, but at $83 including GPS and usable night captures, we're not complaining. Much. There’s a lot to like about the Apeman C550 dash cam, starting with its low price: Just $70 currently on Amazon, and another $13 for the optional GPS moduleRemove non-product link. The day video is quite good, the night video surprisingly so, and the interface is easy to understand and use. 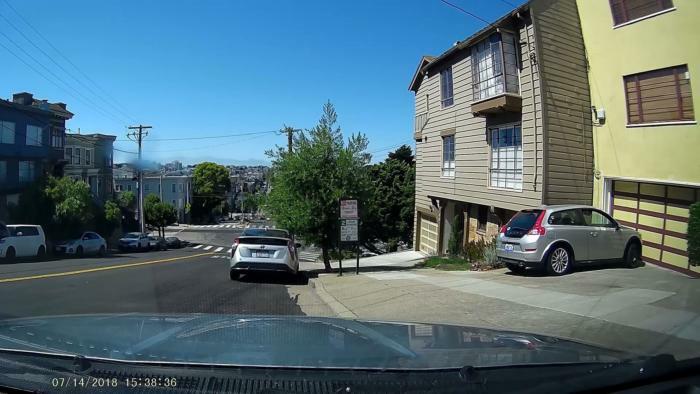 On the other hand, the C550’s rear camera, a feature that sounds exciting for the price, is a hard-to-mount, resolution-challenged 480p model that doesn’t capture fine details such as license plate numbers. Pretend it doesn’t exist and base your decision on the other features. There seem to be a number of “bargain” dual-channel dash cams on Amazon. Tread carefully. The Apeman C550 is vertically oriented. Note that while it swivels on the vertical plane, it isn’t adjustable horizontally, so be careful mounting it. Use a level. The steep angle at which the unit mounts flush against the windshield creates some usability problems. Most notable, it reduces the readability of the already-small, 4:3, 1.5-inch display. Not that you need to do much beyond pressing the buttons, which are still easily accessible, but removing the camera from the adhesive-attached mount is your best bet if you need to to configure it. There are several cameras from Aukey and Rexing that follow the same basic design. It’s not my favorite in terms of interacting with the camera. Said buttons include display/power off (short/long press), menu, record on/off (cursor down), microphone on/off (cursor up), and emergency save/okay. The buttons are multi-mission, changing roles depending on whether you’re recording. You can’t access the menus or take a snapshot when you’re recording, so for stills of surprise events, you’ll have to pull them from the video. Finally, there’s a small reset button on the right side should the unit get confused. I must compliment Apeman on the pleasantly light touch of the buttons. Were there an optional adjustable mount, the modicum of force required wouldn’t disturb the camera’s orientation. As it is, it’s just nice. The rear camera is oriented wrong in this picture. Unless you want upside-down 480p video (it’s bad enouigh already), you need to hang the rear camera from the ceiling. The micro USB, rear camera, and GPS module ports are all located on top of the C550. With the cables attached, it looks like a plant sprouting until the camera is actually mounted in the car, when the wires basically disappear behind the mirror and upper interior trim pieces. In case you’re new to the whole dash cam deal, generally, you tuck the wires behind the molding. Some cameras even supply a tuck spudger. Note: When you add the GPS unit, you’ll need to enable GPS, which is turned off by default. Then there’s the 480p rear camera, which I wish Apeman hadn’t included. The video quality and mounting are so primitive, they distract from the front camera’s many fine attributes. The fixed bracket is meant to be secured to the top of the interior (the opposite of the images), which does not work in my convertible, and there are actually screws supplied. I don’t screw things into my interior. Double-sided tape is also included, but didn’t seem up to the long haul. There are two “driver aid” features: Fatigue alert, where the camera makes a fuss at an interval you specify, and a lane departure warning system. Both work, but again, if you need such things, reassess your approach to driving. Or better for the rest of us, don’t drive. 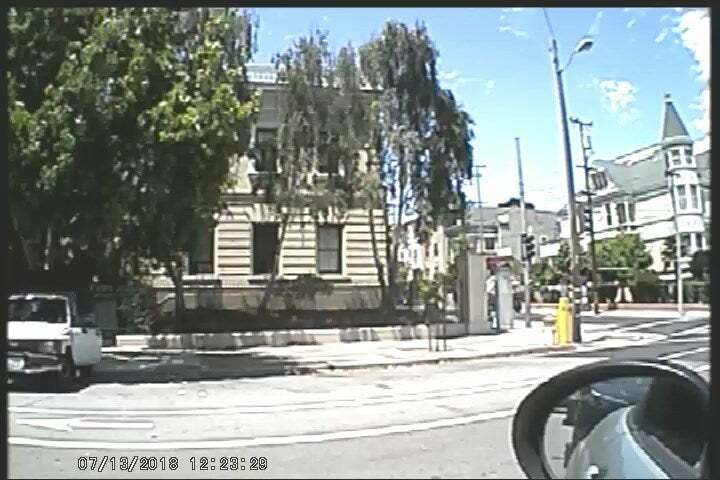 The C550 doesn’t watermark the video with the GPS info, a shortcoming I’ve noticed with Owl, Thinkware, and others recently. The companies already watermark the time and date, and I would think that the GPS watermark would be harder to tamper with than the actual data. I’ve yet to hear a satisfactory explanation for this trend. Its absence could be an issue in court. I never saw a link on Amazon, or the Apeman website, but the company sent me a link to the Datakam Player, which seems to be a free GPS viewing program for the PC from Taiwan (though I found some posts from programmers that indicated Russia might be the origin of the code). It worked well with the Apeman’s video, after throwing a few errors that appeared to be related to the linked online map. Loading a file seemingly cured that. Ask them for it, otherwise, the GPS just tells you how fast you’re going, on a very tiny display, where you can barely see it. This is the Datakam viewer software Apeman sent me a link for. It loads and interprets the GPS data in the Apeman video. Watermarking the video with the data would still be welcome. The C550’s front camera video proved pretty darn good—once I removed the clear plastic protective layer. That took me a whole day to figure out, as the video wasn’t all that bad with it on. Don’t say it. The video is sharp enough to reveal the text on a license plate or street sign, which, believe me, is not always the case. Color me surprised. Day video from the c550 is nicely saturated and offers good detail. It’s not the best we’ve seen, but it’s darn close. The small smudgy area in the upper left over the telephone pole is a flaw in my windshield. Even more surprising was the night video. The WDR (Wide Dynamic Range, aka High Dynamic Range, i.e., more contrast and color) gives it a bit of a yellow cast, and it is rendered dark by default, but a little tweak to the brightness during playback revealed a surprising amount of detail. It’s not on a par with Thinkware’s pricey F800 models, but unlike many cameras, I wouldn’t avoid it for post-sunset surveillance. This is dark, but the detail is available once you adjust the playback settings. Below is a capture from Media Player Classic - Home Cinema with the brightness increased. A lot more detail is visible. Certainly enough for legal purposes. And yes, that’s real San Francisco fog you see. Add a little brightness and you can see quite a bit more detail. Note that this was a slightly foggy night in San Francisco, which accounts for some of haziness. By the way, when I say night video, I’m assuming a little local illumination, such as from a streetlight. If you’re looking for true no-streetlight, no-moon night vision, you need a camera with infrared. I’ve already bemoaned the rear camera video, whose the captures are most likely unusable in court, and are simply not fun to look at. After just a little testing, I removed it. The front camera was easier to place and remove without the extra wire anyway. 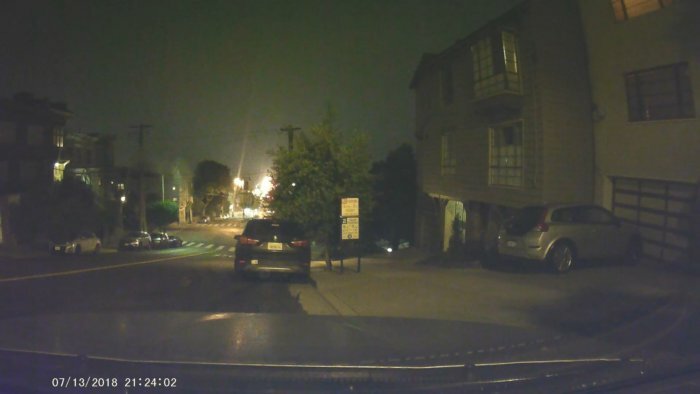 I also noted what appears to be the same camera on a couple of other dash cams on Amazon. If you’re really looking for dual-channel, don’t settle for anything less than 720p in the rear. 1080 is better. It’s going to cost more. This is video from the rear camera held out the window. Because of its fixed mount, it was impossible to place properly for a rear view in my convertible. This is as good as it gets, however, which is not very. Apeman didn’t provide a operating temperature range, but it’s probably the same as with most electronics. Cold is much better than heat. The unit ran a little warm, but seems well-ventilated. Regardless, we never recommend leaving a dash cam to bake in the sun. The only thing in the front camera that even concerned me minutely, was the performance of the g-sensor that detects impacts. It took a pretty sharp rap on the desk for it to preserve a video (from its own overwriting, not your deleting), even with the sensitivity set to high. I quite often must turn down g-sensor sensitivity because of my road/track suspension. If you grab a C550, make sure you test the unit and adjust the g-sensor settings. If it’s like mine, you’ll want to crank them up. The C550 is a surprisingly good basic camera. And at $83 with GPS, it’s a pretty decent deal. If the GPS watermarked the video and the rear camera were worth a darn it would be a heck of a deal. As it stands, forget the rear camera and in general, forget any other dual-camera deal that seems too good to be true. Note: The Apeman stopped responding permanently when I inserted a flash card while it was powered up. It’s probably not a good idea with any camera, but surely avoid it with this one.